Now that Apple has put reality distortion inside every iPhone, we’ll get to explore new realities with apps like these. While Face ID may be capturing headlines, its Apple’s ARKit that will make a much bigger difference to iPhone user’s lives. Here are some of the first wave of AR-ready apps to be made available at the App Store around the launch of iOS 11. More are appearing rapidly at time of writing. This has been widely discussed. The app uses ARKit to let you try furniture out in your room. It accurately senses scale as it places your virtual items. The latest update to this popular weather app lets you look at weather information in 3D. One Drop lets you visualize your daily moments and glucose range graphs in AR, giving you nicely engaging graphics to help you understand your situation. This useful educational app lets you explore 3D models of parts of the body while you try to learn anatomy. PCalc is a really nice calculator, but it now adds a new AR demo mode that lets you throw virtual objects around your room. As demonstrated last week, this highly entertaining action game is now available. You, too, can send a highly violent Imperial Knight into your local mall. These early implementations are destined to be joined by a growing collection of useful AR apps. Developers are really thinking about how these technologies might be used in tangible ways. Here's a few interesting app ideas: Maker Studio, Orb, and the Neon social AR messaging platform. I’ve written before on some of the potential enterprise implementations for Apple’s AR technologies — these seem to be coming along. 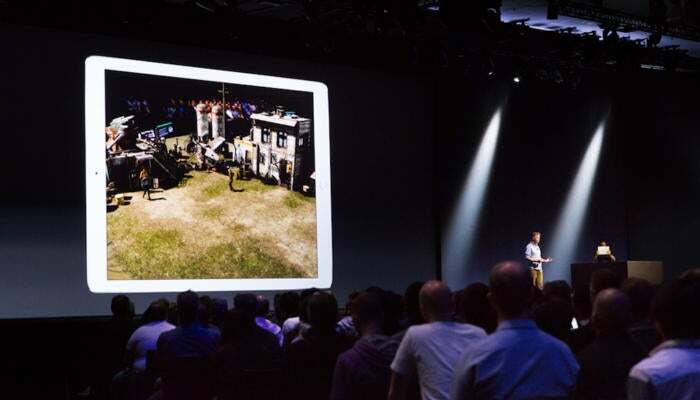 “Augmented reality mobile applications for shopping can boost retailer performance by many measures: increased market share, sales and profitability,” explained Scott Dacko, associate professor of marketing and strategic management at Warwick Business School, in a major 2016 U.S. study of the potential of AR to transform retail. We’re going to see similar impacts in real estate, car sales, city management and elsewhere in Industry 4.0. Fybr builds sensor networks for city traffic management, agriculture and industrial implementations. The video below shows a proof-of-concept ARKit app that takes live parking information from its sensor networks on various city streets and makes it available on an iOS device. That’s useful if you are a driver using an HUD, but it may also prove itself valuable to city transit authorities. What's important is that this proof-of-concept solution underlines that Apple is not a pure consumer play. There are significant opportunities for enterprise and industrial use, including the $20 billion market fast prototyping and product design currently coalesced around AutCAD and Autodesk. Finally, Apple quite clearly sees the potential for ARKit use across galleries and public exhibition spaces, as this demo of its ARkit-based Apple Park visitor center exhibition shows. What I'm saying is that while the initial rush of AR-enabled iOS apps may often seem more experimental than essential, that’s going to change rapidly as iOS 11 proliferates and developers identify clear sectors in which the tech can make a useful difference.